Hi There Here&Now Lovers! I am Jessica from DahliaLynn. I am so honored that sweet Jess has allowed me to spend a little time with you, while she is out of the office. If you hang around Here&Now and/or DahliaLynn, you know that Jess and I are blogging soul sisters. Both named Jessica, both from Arkansas, both went to school/work at Vanderbilt, both currently live in Nashville, both love pugs, both bloggers, and both love fashion. See...soul sisters...right? I have been dying to write for one of Jess' regular features called "Trends that make you go hmmmmm." Over at DahliaLynn we wear some crazy stuff and my style mantra focuses on dressing to the beat of your own drum and wearing what makes you happy. I really like to try out trends at least once and make them my own before giving the thumbs up or down. But that doesn't mean that every once upon a time, a trend makes me think long and hard before I give it a whirl. 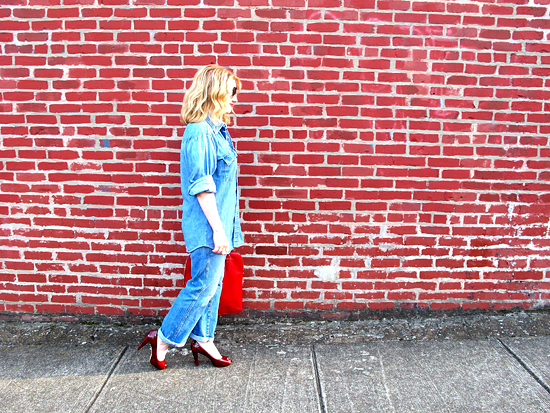 Enters the Canadian Tuxedo. I mean I have some mad love for jeans, but do I really want my whole body to be covered in jeans? Hmmmmm....I just was not sure at first. Did not help that I kept seeing the trend on very slender ladies with fitted skinny jeans and tucked in jean tops. I mean the glamazons look great and all, but I was not sure I was ready to stuff curvy, little me into jean everything. Though I had some favorite jeans, I decided to wait to try the trend until I found that perfect jean top. Loose, soft, and with details that would not leave me looking like I was the groom in a Texas Tuxedo wedding if I wore the shirt with jeans. So when I finally found, the One, the perfect match to try the Canadian Tuxedo look, I was thrilled. And the trend no longer makes me go hmmmm. I wear this loose button up with dark skinny denim jeans or my boyfriend jeans (I don't have a boyfriend...just the jeans...that did not come from a man...just a store.) I always try to soften the look with feminine heels, a statement necklace, and a bag with a bright pop of color. A bold lip doesn't hurt either. So what do you think? Did I nail it or are you still left thinking....hmmmmmmm? If you like what you see, I would love for you to take a little visit over to DahliaLynn if you have never been. 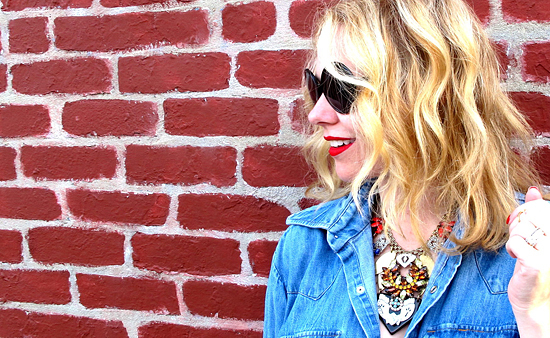 Sequins, color, vintage, and jewels are always around. Happy Day and a big thank you to Jess for having me! so cute!! 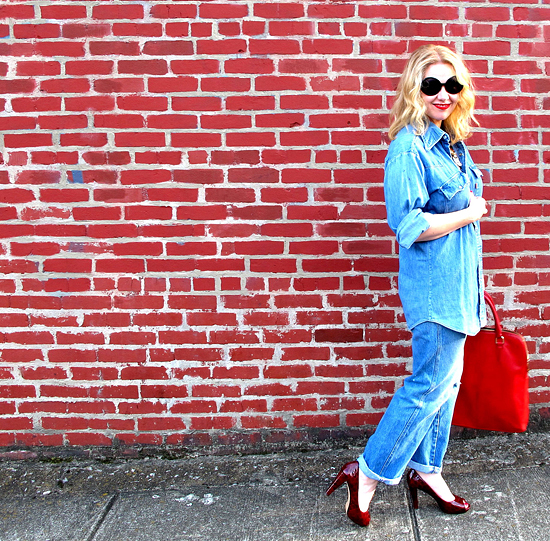 LOVE your canadian tuxedo! Molly...thank you so much...I love a comfy outfit! HOpe you are having a great day!! Jenniya...thank you for the bag love. It is one of my favorites. Also love the cute little hat in your profile picture! Happy Tuesday! i'm a denim lover, too! I think I would like this look more if one of the pieces was fitted. Moria...I love an all denim look with some more fitted pieces as well. Hope you are having a great day! I just love a good Canadian tuxedo! 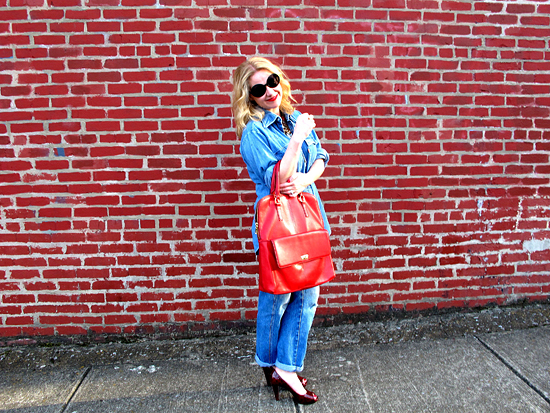 Denim on denim is such a casual and easy look... perfect for Summer. Great post, girl!!! Love your take and thoughts on the Canadian Tuxedo. Hope we can get together for coffee soon. And other Jess, hope you are having a great trip! 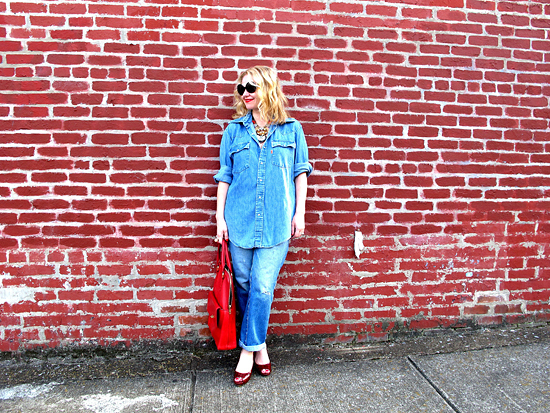 Chelsea...glad I am not the only denim on denim lover. It is just sooo simple:) Happy Wednesday! Julie...thank you so much for the outfit love. I really appreciate it. And I will always take two comments:) Happy Wednesday! Coffee...soon....YES! Thank you for commenting sweet friend!! Glad that someone noticed my attempt fo the matching red lip and bag:) Happy Wednesday Lisa! Love Jessica! Well both of you are just too cute! !